Last Saturday, my sister brought me to a vegetarian food party which organized by Tzu Chi Malaysia 慈濟 (Tzu Chi Foundation is a non-profit organization founded in 1966 by Dharma Master Cheng Yen in the impoverished east coast of Taiwan. The Foundation has been contributing to better social and community services, medical care, education and humanism in Taiwan for nearly forty years). My sister is now one of the volunteer in this center. 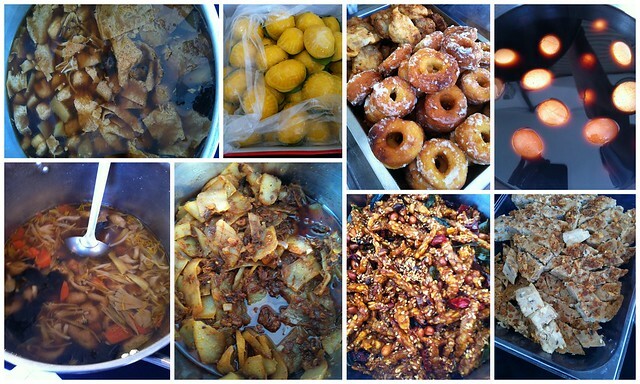 I was truly enjoyed all the yummy vegetarian foods prepared by their members. Also I learnt this vegetarian dumplings from them.. They also talk about the benefit of eating vegetarian foods and encourage us to eat less meat and oily foods (cheese, butter and etc) to have a better and healthy life..I was inspired by this talk and I will start to cook at least one vegetarian meal once in a week.. They also do recycle activities in this center..
One tip from her, make this flour water to get a cripsy bottom of dumplings.. Adding the flour water, you can see a thin layer of cripsy cooked flour at the bottom.. 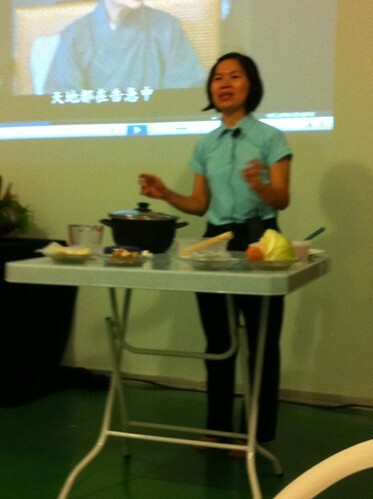 This is the filling, they suggested to use the mushroom stem (not to waste by throwing away and the stem actually has nice texture)..
To make round dumpling wrapper, use the end of the rolling pin and roll by turning the dough in circle..Since this is homemade, do not force yourself to get a perfect round wrapper..Even is uneven, after wrapped, you will still see nice dumpling shape..
Too bad, I'm not able to take the video to show you how i wrap the dumplings. Let me show you the pictures as per below, the steps actually start from pull, fold, press and seal the wrapper..
1. Soak dried Shiitake mushroom stems for overnight. Braise with water (season with light soy sauce and vegetarian oyster sauce) for 1-2 hours (I use pressure cook to cook for 20mins). 2. 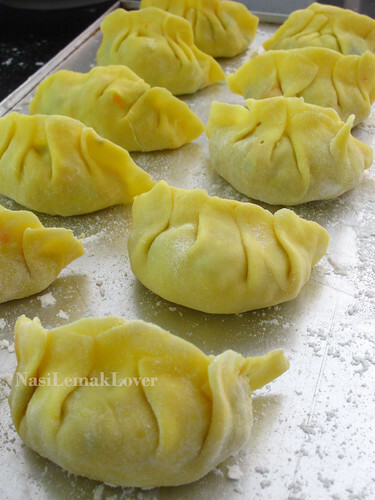 To prepare dumpling wrapper, mix flour with pumpkin water, knead till smooth dough, set aside to rest for 1hour. 3. 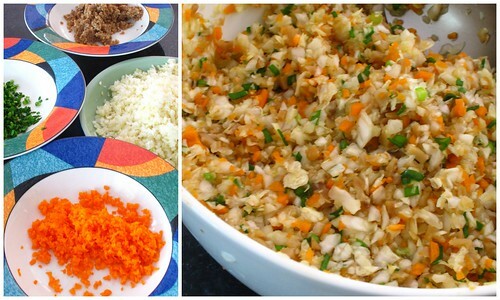 To prepare the filling, squeeze as much of water from cabbage, mix with carrot, chives and mushroom. Add in seasonings, mix till combine well. 4. 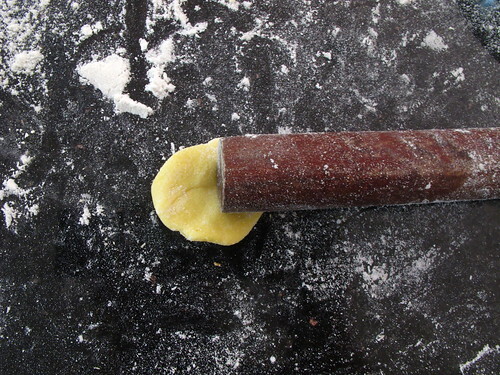 Dust worktop with flour, divide dough into small pieces, use rolling pin to roll dough into round and thin. 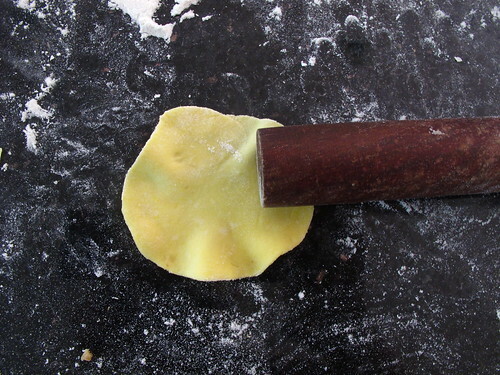 Place a small spoonful of filing on the dumpling skin, fold it accordingly. 5. 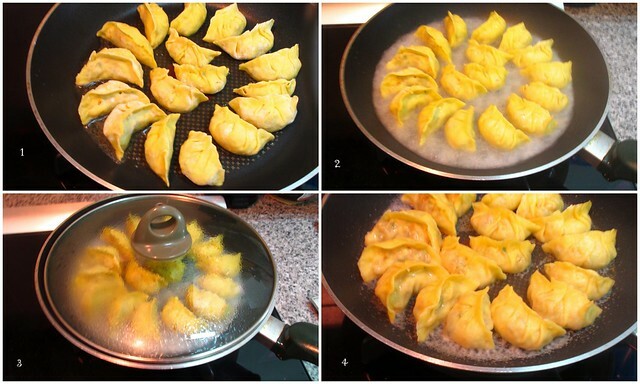 Add little cooking oil in a non-stick frying pan, fry dumplings over medium heat. 6. 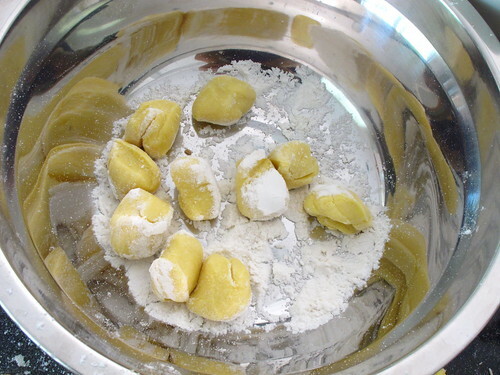 Once dumplings bottom turned golden brown, add some flour water and cover with lid immediately, cook over high heat. 7. Cook for about 2-3 minutes till water has evaporated. 8. 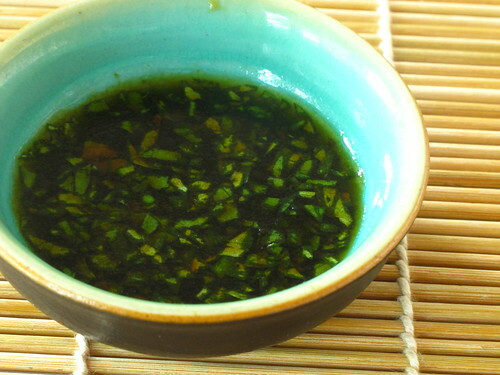 Dish out and serve with dipping sauce (Light soy sauce, sesame oil, water and basil). the dumplings look great and the flour trick is neat. These sound and look really delicious! I love how the skin is made with pumpkin. I might just try this out soon. Looks great. I tried pumpkin dumplings in Central Asia. Its strange, they eat lot of meat and it was unusual to find pumpkin dumplings (but its made with pieces of animal fat in it)! Have a great week ahead, Sonia. Thank you so much for sharing this, love them so much! Will definitely going to try it!! Sonia, thanks for sharing. 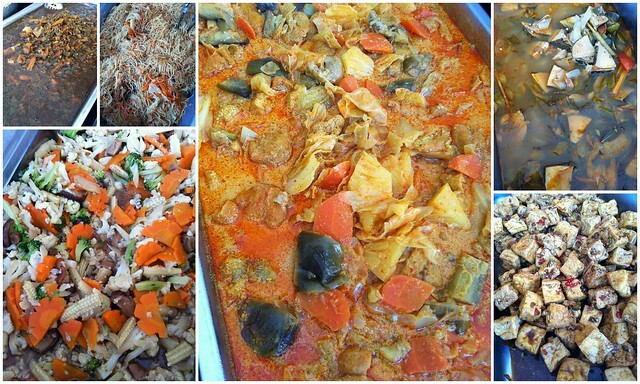 You provide very clear step for us to follow and easy to cook. Never had a pumpkin dumpling before but I am sure they are delicious. Pandai sangat lo. I am Zhu chi member also lei. In Malaysia n in Perth. 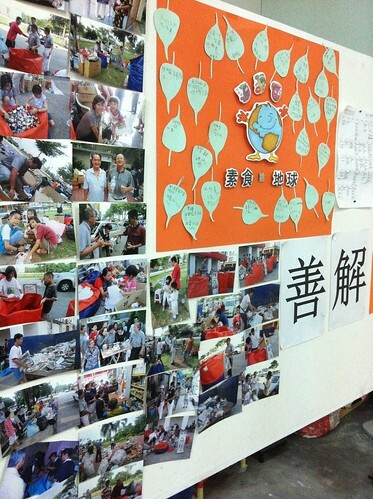 I am a volunteer worker in malacca branch last time. I learnt many veg food there too. I miss 师姑，师伯，师兄，师姐very much. Especially those time we work together. Happy memories. Very neatly wrapped, in fact perfect! 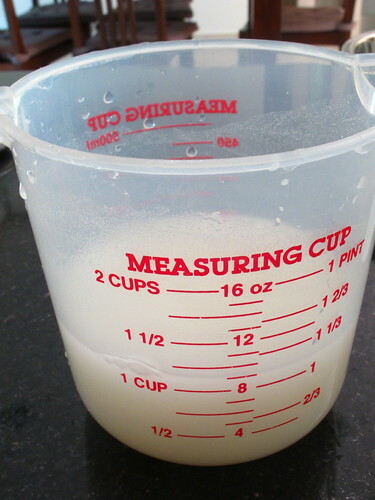 I also learned this flour water method from my Taiwan friend and used to fry the guo tie too. Learn something new from you. Thanks for this great recipe. Very healthy to serve. Your dumplings are very neat. The first thing that I noticed was the pleats! How gorgeous these dumplings look..Then I notice the filling. Oh, give me more! 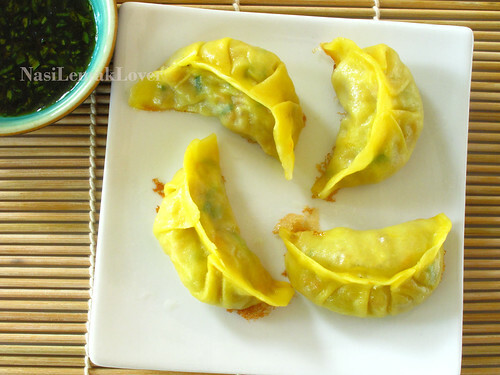 I love dumplings and will always made a huge batch and freezed them. I like the idea of adding pumpkin to the wrapping dough but hardly make it from scratch. Usually get them from the Asian store. Maybe I should do it. Looks very delicious yummy !! Wow, these look great, so tempting. 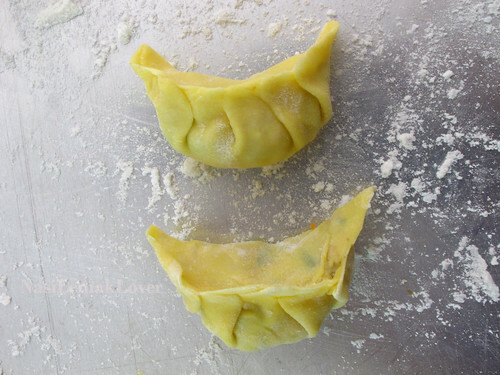 I have made many dumplings before but have not tried making the skins yet. I love the pumpkin wonto wrappers. ohh this sounds just delicious!!!! I want some! this proves thatvegetarian food can be just as yummy, and not boring at all! 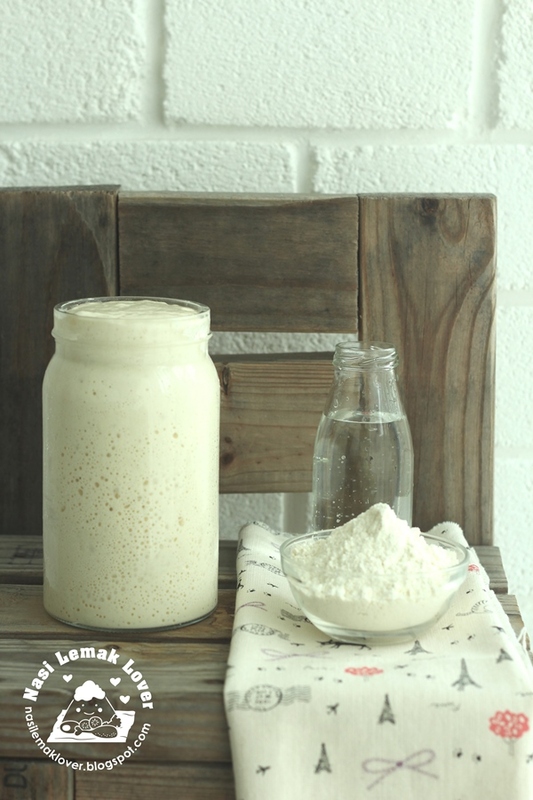 thanks for the flour water tip! These looks really delicious ! I love the homemade wrapper and of course all that yummy and healthy filling ;) I've been meaning to try that flour water trick for quiet sometime as I've seen that from one of the dimsum book that I borrowed but keep forgetting to do it when I cook my dumplings tsk ! Lovely post , Sonia ! My dear, really loves dumpling.. Nowadays, easily can get the Halal one.. My eldest girl is a great fan of any type of dumpling. She always asks me to DIY d dumplings.. Tried few times, but always frustrated with d looks.. Tastes OK I guess.. Will study your available recipes later..
Wooo, healthy veg dumplings......taruh lots of chilli sauce...nice! i want to try this dumpling cos my mother is a vegetarian. 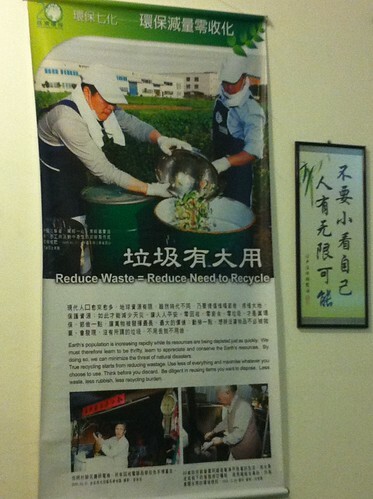 I noticed that there are a lot of vegetarian places in Taiwan. My mom use the cornstarch + water method too, and it gets nice and crispy bottom. I'm too lazy so I usually skip that. I love the color on the wrappers. It's much cuter than regular one! 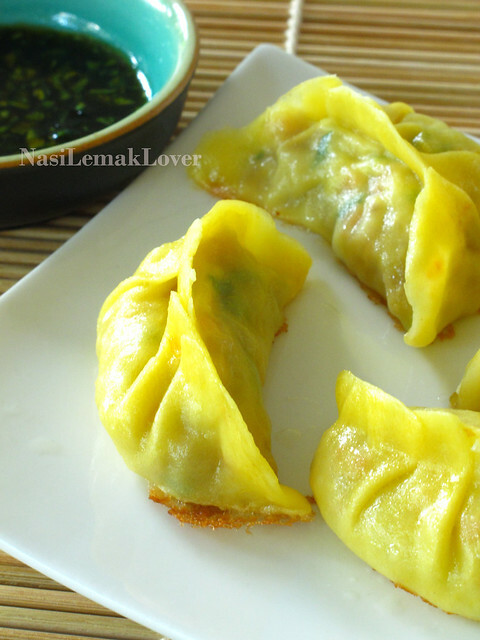 Vegetarian dumplings are always my fav and you made so well. I'm drooling reading your post now. I never throw my mushroom stems, they have loads of flavour. Recycling is very important.. for the benefit of the future generation, but sometimes the stupid garbage man just throws my whole bag of glass bottles that I cleaned for them direct into the garbage cavity instead of into the recycling baskets they have hanging by the side. So geram! They look AMAZING yum, would love to get lessons as all looks a bit scary. 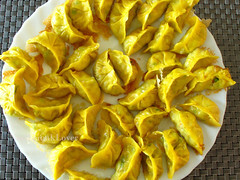 Thanks for sharing, such a good recipe intead using the store bought dumpling wrapper, would love to try it. 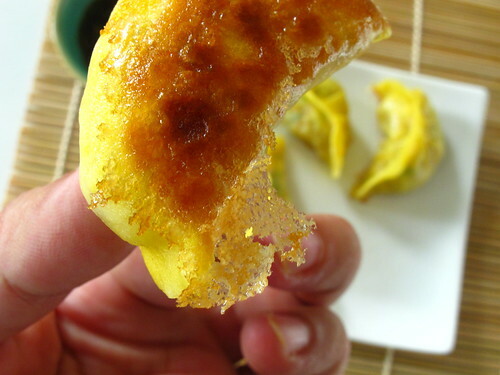 Yes, I always enjoy eating the crispy crust of these dumplings/gyoza. So tempting to make these myself now after studying your recipe! These dumplings look so good. Yum! 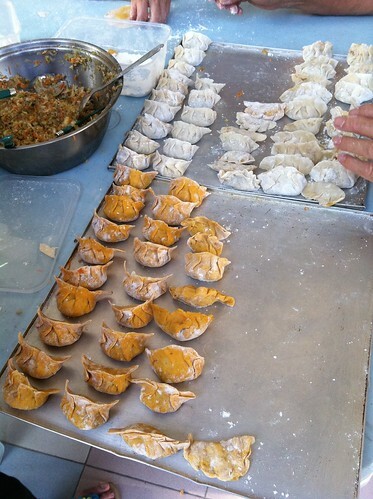 The dumplings were beautifully wrapped, they liik delicious too. Thanks for sharing. Love dumpling. 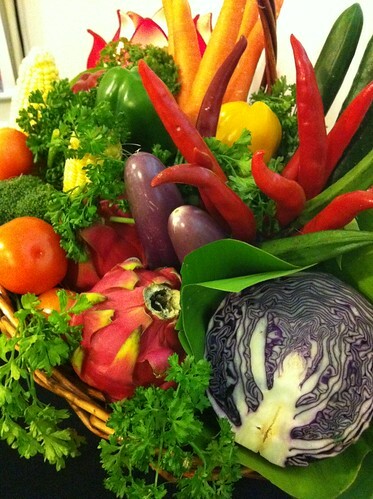 Look very delicious and healthy. 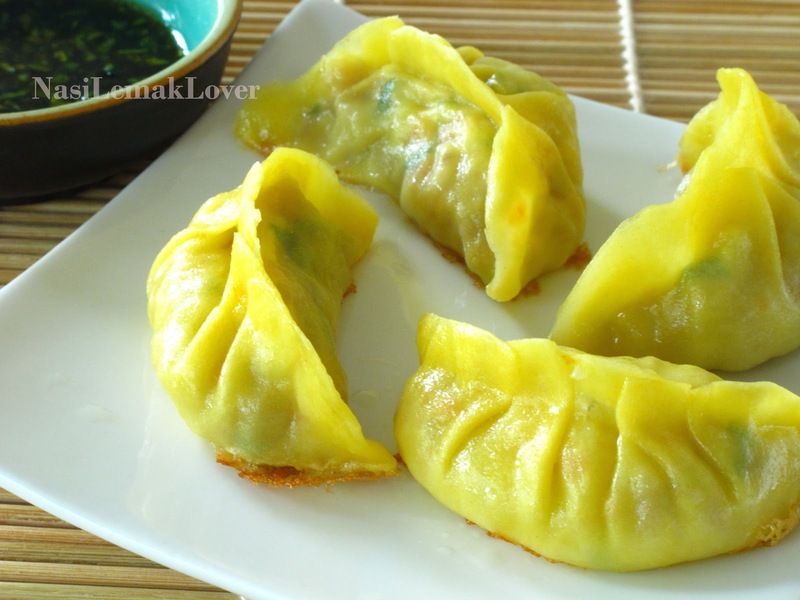 Oh wow, a Veggie Dumplings looks so nice that tempting me to bite one of them. looks so delicious...can tumpang makan? Your dumplings look beautiful! Nice color too. I do miss the great variety of vegetarian food you can find over there. Everything looks delicious! Hi friends, its enormous piece of writing about tutoringand entirely defined, keep it up all the time.